Plot: Product Description: Simply beautiful tale of a pair of emotionally wounded World War I veterans who find some respite in the beautiful Yorkshire countryside and in their supportive friendship. As they work, respectively, on the restoration of an ancient church mural and the possible unearthing of an archeological treasure, they also encounter the local vicar’s young wife. Between them, this trio reflects the many faces of love and longing. honored with a lovely Blu-ray release of this 87 classic. A Month in the Country is simply put, a vibrant beautiful film of extraordinary acting, directing and utterly fantastic cinematography. Directed by the wonderful Simon Gray. This is a course adapted from the book, which is one of those books that should be read, and really is a masterpiece of storytelling. The book by the same name is written by author J.L. Carr. I highly recommend you do both, read the book, and watch the movie. Both are in themselves, one a great piece of literature, and another, a great piece of cinema history. I was excited to hear that Twilight Time was releasing this on special edition Blu-ray. I was looking forward to finally seeing this with a proper treatment. I had only seen it on a VHS copy. The film transferred to Blu-ray is absolutely breathtaking. Looks new. Crisp and clear in both audio and video. This is one of those films that you can watch over, and over, and over again. It's such a wonderful piece of cinema that just leaves a lasting impression. An all-star cast. This is one of Colin Firth’s greatest performances. Firth is a dynamic actor that creates perfection on film. His role as the character Birkin in A Month in the Country, showcases his master talent. Also starring the amazing Kenneth Branagh. Always a treat to see him perform. Also starring the beautiful Natasha Richardson as the character of Alice. I still have a hard time knowing she died so young. She was a beautiful and amazing actress and her talent shines in A Month in the Country. Also I have to mention this stars Jim Carter. A wonderful, often character actor, who has been in many wonderful pieces of cinema both small and large. Most famous today for his role of Carson in Downton Abbey. The whole cast is flawless and stands out. This is a complex and very intelligent film directed by Pat O'Connor. O'Connor has a very complex career of movies under his name. The few films he had directed, many of them stand out as important pieces of dramatic films that give, great, strong, acting, direction, and entertainment. A Month in the Country is a prime example of that intelligent, memorable film making. If you have not experienced his film making, I plead you do so. Besides, A Month in the Country, he has mastered such films as: Circle of Friends (1995), Inventing the Abbotts (1996) which both are worthy films to be seen. His direction has life, vibrant, and vivid in capturing the story at hand, and bringing a sense of emotions. A true reality of life displaying itself on screen. 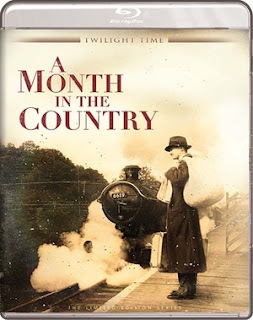 A Month in the Country which was written by J.L. Carr was adapted for the screen in script form by Simon Gray. This was Carr's 5th book. Simon wrote a relatively faithful adaption of the book. Carr was a teacher, a writer, and an all-around imaginative storyteller. A Month in the Country showcases that brilliance. Sadly this film, had been neglected over the years. It was given a really horrible VHS transfer. Then was given a special edition DVD, but still didn't have the greatest quality. Thankfully, Twilight Time recognizes this brilliant piece of cinema, and has gifted this film with a transfer that it deserves on a new outlet. A new dynamic outlet. Magical transfer in both audio and video. Truly a stunning experience to see this film treated the way it should be treated. Looks vibrant and crisp in color, and the sound is the same. The whole Blu-Ray is a must for any lover of cinema. Isolated music score. Now what ultimately stands out is the music soundtrack by the talented and amazing Howard Blake. The music was scored through a string orchestra adding to the complex style, of a modern 20th Century British style of music. Blake was given an award titled the Anthony Aswuith Award. The award is for Musical Excellence and was given by The British Film Institute in 1988 for this film. You also get an amazing Audio Commentary with two of my favorite Film Historians, Julie Kirgo and Nick Redman. This special feature like many of the other wonderful released products by Twilight Time, is a golden example of love toward cinema. This is the best the movie has ever looked. It looks so beautiful. It's hard to express how amazing the imagery is. Compared to other watched released examples of this film, nothing compares, and in reality could not be any better.